A pie chart displaying the results of SG's referndum to see if students are for or against a per-credit-hour fee being implemented into tuition to help fund an on-campus football stadium. 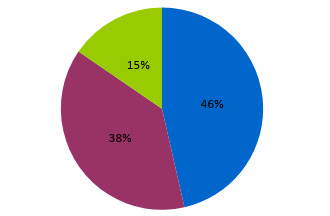 Students who are against the fee are displayed in blue, students for it in purple and students with no preference in green. Forty-eight percent of USF students who voted in midterm elections last week said they are against implementing a fee of $6 to $9 per credit hour to help fund a future on-campus football stadium, according to records obtained by The Oracle. The records indicate that 1,753 students voted, with 814 voting against the potential fee, 668 for it and 271 saying they have no preference. The results do not mean Student Government (SG) cannot still attempt to pitch the fee to USF’s Board of Trustees (BOT), which would then have to approve it. The vote was simply to gain student feedback, SG says, that it then intends to use in its pitch to the BOT. The potential fee would add $90 per semester to students taking 15 credit hours if the fee were to be implemented at $6 per credit hour. It would cost students taking the same courseload $135 a semester if passed at $9 per credit hour. The 1,753 students who voted make up only 4 percent of USF Tampa’s student population of 43,866. If the fee were to pass USF’s BOT, it would then have to pass through Florida’s Board of Governors and then must be approved or denied by the Florida governor. USF’s vice president for administrative services, Calvin Williams, said in 2017 that the stadium’s construction, even if it had all of its funding today, would be at least five years away from completion. Top SG officials did not immediately return a request for comment.